Paper Title: ‘French May, 1958-1968’. The Fifth Republic can perhaps be viewed by its proponents as a tonic for the chaos that surrounded the collapse of the Fourth. Yet, Grey Anderson contends, that legacy should be read more critically, and so too the forgetfulness that washes the Gaullist Republic of its links to the attempted coup d’état that precipitated its birth. What emerges is something of a pattern, both of strategic dramas that called for Gaullist intervention and then strategic forgetting that sanitized the General’s role, casting him as a guarantor of Republican tradition as opposed to its disruptor. 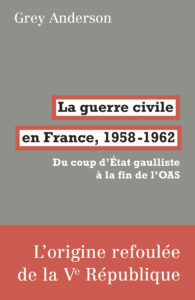 Grey Anderson travelled from Paris to present on this, the topic of his recent book, published in French as La guerre civile en France, 1958-1962: Du coup d’État gaulliste à la fin de l’OAS (Paris: La Fabrique, 2018), and soon to be translated into English. Grey recently graduated from Yale, before finishing a post-doc at Sciences Po, and is currently based at the University of Caen. His fascinating paper wove a sweeping narrative that reconsidered the ways in which we understand the first decade of the Fifth Republic, looking at its origins and also the challenges to the Republic that emerged amidst the strikes and protests of 1968. Speaking about the outcome of the strikes and protests of May 1968, Anderson quoted Andre Glucksmann who said that instead of upending the legacy of May 13th , there had been a repeat of it. The continuities and ruptures between these two May events gives an intriguing sense of how support for the Fifth Republic was manufactured and reframes a narrative of Gaullist coups. As consensus around the Fifth Republic’s beginnings settled, the regime’s origin story became about the chaotic downfall of the IVeme, and the consensual after-image of De Gaulle as guarantor of democratic institutions occluded the Algerian cauldron in which the Veme was forged.